If you are a nursing professional and would like to care strictly for patients who are battling cancer or who are in remission, it is time to learn how to specialize a nursing degree in oncology. 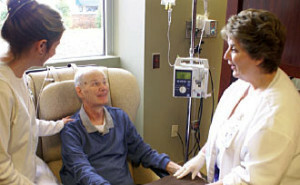 Oncology, which is the term used to describe the study of cancer, is a very broad field where oncologists and oncology nurses will help advise patients on the newest cancer prevention techniques, treatment options and also provide end-of-life palliative care for those who are in the later stages of the disease. For nursing professionals who are compassionate and can provide support while they administer treatments, this could be a great specialty. Read this guide to oncology nursing and learn how to become a specialist. The first step to becoming a specialist is to attain general knowledge in the field. If you are not yet a nurse, your first mission will be to take a nursing degree program that will make you eligible to sit for the national licensure exam. While you can take a two-year program, taking a Bachelor of Science program majoring in nursing will take you further when you are ready to advance your knowledge. This is why you should compare the best BSN programs that are accredited by the American Association of Colleges of Nursing (AACN) so that you know that the content meets the standard set by all state licensing boards. The next step to becoming a specialist will be to get experience in a cancer care environment. This is where you will gain practical skills that show that you are competent and capable. You need both the proper education and the right amount of work experience to eventually get certified. If you want to be an oncology nurse practitioner, you will need a minimum of 500 hours of experience nursing in oncology. There is a high demand for all types of nurses, even nurses that provide general and routine care. While demand is high in the field as a whole, there is a wide and growing gap between the supply of oncology nurses and how many are graduating from school. With the demand showing the potential to grow by 19% by the year 2022, this could be a great opportunity for nurses who want a career change and want to make a difference, according to Nurse Journal. Be sure to earn your Master’s and specialize a nursing degree in oncology and you will be one step closer to being a nursing practitioner with specialty knowledge.